1997-02-09. New. Ships with Tracking Number! INTERNATIONAL WORLDWIDE Shipping available. Buy with confidence, excellent customer service! Doubleday Canada, 1997-09-02. Hardcover. Used:Good. 1997-02-09. Good. Ships with Tracking Number! INTERNATIONAL WORLDWIDE Shipping available. May not contain Access Codes or Supplements. May be ex-library. Shipping & Handling by region. Buy with confidence, excellent customer service! Toronto: Doubleday of Canada, 1997. Fine copy, in a fine jacket. Signed on the title page.. Signed by Author. First Printing of the First Edition. Hard Cover. Fine/Fine. Toronto, Ontario, Canada: Doubleday Canada, 1997. First Edition . Hardcover. Fine/Very Good. 8vo - over 7¾" - 9¾" tall. Fine burgundy cloth. Illustrated endpapers. Very good red DJ. Light spine wear and tear, previous owner name inside. (1997), 8vo, , 10-391pp. 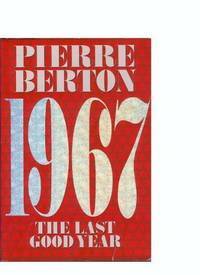 , "It was a turning-point year, a watershed year, a year of beginnings as well as endings..."
Doubleday Canada, 1997. A fine hardcover with a fine dust jacket. 1st printing.. By Author. 1st Edition. Hardcover. Fine/Fine. Toronto: Doubleday Canada. Very Good in Very Good dust jacket. 1997. Hardcover. 391 pp. Photos. Spine, corners bumped. Jacket has light edgewear. Prev owner's name stamped on the title page. A history of Canada's golden year, a watershed year in her history. ; 8vo 8" - 9" tall . Doubleday Canada, 1997-09-01. Hardcover. Good. Doubleday Canada. Used - Very Good. Former Library book. Great condition for a used book! Minimal wear. Doubleday Canada. Used - Like New. Ships from Reno, NV. Book in almost Brand New condition. 100% Money Back Guarantee. Shipped to over one million happy customers. Your purchase benefits world literacy! Doubleday Canada. Used - Good. Ships from Reno, NV. Shows some signs of wear, and may have some markings on the inside. 100% Money Back Guarantee. Shipped to over one million happy customers. Your purchase benefits world literacy! Doubleday Canada. Used - Good. Former Library book. Shows some signs of wear, and may have some markings on the inside. Doubleday of Canada, 1997. This is an ex-library book and may have the usual library/used-book markings inside.This book has hardback covers. In poor condition, suitable as a reading copy. Dust Jacket in fair condition. Doubleday Canada. Hardcover. GOOD. Spine creases, wear to binding and pages from reading. May contain limited notes, underlining or highlighting that does affect the text. Possible ex library copy, thatâll have the markings and stickers associated from the library. Accessories such as CD, codes, toys, may not be included.